Non-Space, a gravitationally inducing natural phenomenon, can be demonstrated to exist in a laboratory experiment. A solar prediction is also offered. Does Non-Space exist, can it induce gravity? I will be the first to admit that the concept of Non-Space and gravitational induction seem at first glance to be outrageously preposterous. After all, the three other states of matter, solid, liquid and gas exhibit no such qualities, and from these observations we have assumed a universe in which gravity is inviolate. However, to date no plasma scientist has looked to see if a high energy plasma discharge induces gravity. The concept of Non-Space rests on a plasma laboratory experiment that could be performed within the limits of contemporary technology, and an observational solar neutrino prediction which I am told will be forthcoming in the foreseeable future. Consider the theorized black hole, an over-abundance matter falling in on itself becoming a gravitational sink that even light cannot escape from. It is useful to think of Non-Space as being on the other end of this spectrum. Non-Space is a condition in which space is vacated from a volume. Thus, it is not an empty space, it is a volume empty of space. This Non-Space volume causes exterior space to implode gravitationally upon its boundary. It is a violent reaction as space attempts to close up the non-space, and in doing so, annihilates mass into energy as it presses in upon the Non-Space boundary. How can Non-Space come about? Non-Space is achievable with a high energy plasma. A high energy plasma imbued with a dynamo effect causes electrons to disassociate from protons. These then act within like camps, electrons with electrons, and protons with protons, each particle contributing its magnetic moment to the whole. I believe it is the repulsion of these like camps that disturb the fabric of space, allowing for the appearance of gravitationally inducing Non-Space. This condition can be a momentary, or a sustained phenomenon. What evidence is available to demonstrate the existence of Non-Space? If Non-Space comes about at the moment when dissociated electrons and protons contribute their magnetic moment to the whole, then this ought to be observable. I propose that a gravity measuring device be coupled to a high energy plasma discharge, such as a z-pinch. If I am correct, this will demonstrate a minute but measurable momentary increase in the force of gravity towards the discharge and in doing so will demonstrate that gravity can be induced without a corresponding quantity of mass. A successful outcome of this experiment will have far reaching implications, because it will confirm a direct link between the electric, magnetic and gravitational forces. 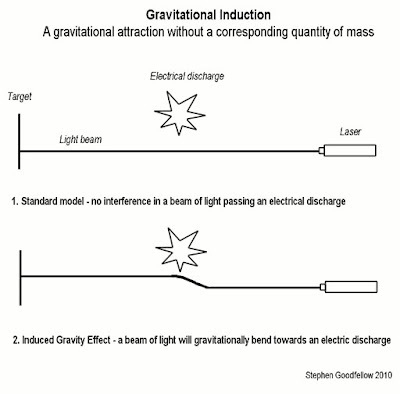 Furthermore, gravitational induction will have fundamental implications upon the very foundation of contemporary physics, because the experiment will demonstrate that the relationship between mass and gravity are not inviolate. From the many inquiries I have made over the years, I am given to understand that this experiment has not as yet been performed, and that there is no one other than myself who is expecting a positive result. I liken it to Hans Christian Ørsted's accidental experiment, when he happened to notice a compass needle jump when inducing a current through a wire. 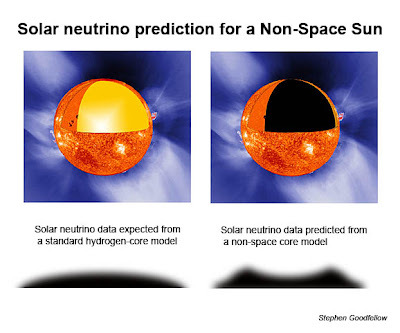 The observation I seek, is a compilation of solar neutrino data which will show that the angle of incidence of solar neutrinos emanating from the Sun will be expressed in a concave graph rather than a convex graph. A convex graph, is what one might expect from a standard model of the sun, with neutrinos emanating from the Sun's center. The concave graph which is what I am predicting, will demonstrate that neutrinos are emanating from the shell and atmosphere of the Sun, and not from its core. To my knowledge, no one is expecting a concave graph. The data will infer that the Sun is a magnetically constrained Non-Space volume. This volume is sustained by an exterior shell best described as a magnetically unified high energy plasma. 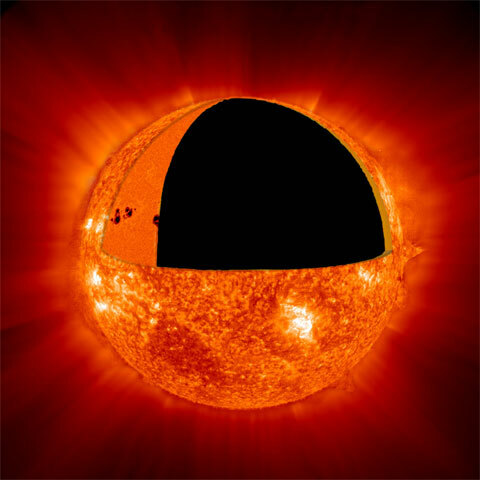 The interior volume of Non-Space induces gravity, causing the Sun's shell to continually implode. This implosion of the Sun's mass releases energy, magnetically sustaining the Sun's interior volume of Non-Space. I make no claim as to the particular electrical or nuclear chain reaction leading to solar energy output, merely that it is distributed in a shell, gravitationally crushing in on the Sun's interior non-space. A Non-Space solar interior would also explain why sunspots are dark rather than light, and why strong magnetic fields are associated with these lower depressions in the Sun's photosphere. Also, an expanded solar shell of matter with a Non-space interior would account for the Sun's slow rotation, in that the rapid expansion from a smaller, dense proto-star to larger shell would slow its angular momentum. I expect significant skepticism for these extraordinary claims, and I realize that the experiment and observation might well return a null result, rightfully condemning my contemplations to the historical trash-heap of absurd ideas. Consider though, that the plasma experiment is achievable with our present technology, and I suspect at a relatively reasonable cost, and I am to understand that the solar neutrino data-collection ought to be available the foreseeable future. Science tacitly assumes that the forces of nature are unified. It would be a great shame not to perform the plasma experiment, for if by the slimmest chance the experiment produces a positive result, is that not in itself enough incentive? And should the proposed experiment with the potential seed of a positive result languish, would history not condemn today's plasma physicists for their reticence? Would we have to wait, leaving the discovery to a future generation, a generation who would look back - and mock us? Your links don't want to play though. They work from Your website . "An Empty Sun - Is Gravity being Induced?" "Non-Space, Is Gravity being Induced? A Challenge to Plasma & Neutrino Physicists"
This thread was removed from the forum after initial accusations of plagiarism made by Constantin Leshan against Stephen Goodfellow, who initiated the thread. Leshan argues on the basis that he first published on the same topic in 1994, and that he has authored papers in peer-reviewed journals on the topic, which is easily verifiable. Goodfellow responds (both privately and elsewhere on the web) that he first wrote on the subject in 1979 and whilst this is not publically verifiable, a search for "Can Gravity be induced?" brings up instances of Goodfellow having written publically on the topic at least as early as 1987. EDIT: Goodfellow has posted a more explicit refutation here. It is not unusual in science to find two or more people unearthing similar ideas at around the same time, often with no knowledge of the others' work. My recommendation to both parties would be to communicate directly with each other with a view to collaboration, rather than participate in a public feud. Should a reasonable compromise not be forthcoming, then Law Courts are the appropriate place for challenges of plagiarism. As this forum is public domain I have decided to reinstate the thread, with the proviso that further argument over authorship of the theory not take place here. It is enough that a challenge has been raised, and it is in the public interest that it remain in the public domain. Disclaimer: The Thunderbolts Project has no interest in theories which posit unseen/unknown/unlikely scenarios such as are often raised on the lower boards of this forum, and only allows such topics to remain in an effort to allow most people to have their say without being subject to over-censorship. If You view the universe as an electrical information filled place, then it would seem totally reasonable to presume that various people with similer intersests would attract the same or similer information in the same time frame. Then instead of half the world looking for spies everywhere ,it could be realised that what is required is for the seperate parties to be brought together, not this isolation based system We have now. We are stuck in tribalism still. I thank both the posters involved here for enlightening myself with what they have revealed here. And applaud this forum for re-instating this. ...Then instead of half the world looking for spies everywhere ,it could be realized that what is required is for the separate parties to be brought together, not this isolation based system We have now. Kevin, couldn't have put it better. My thoughts exactly. While in high school, in the summer of 1990, I was attending a summer art program at the Center for Creative Studies College of Art and Design in Detroit and had the privilege for being able to visit Stephen Goodfellow in his art studio to learn about his micro-pointillism artwork. I'm not certain exactly what got us on the topic (I guess I must have mentioned my interest in physics), but we started to discuss his hypothesis on non-space. On my way out, he gave me a copy of his then paper, "Verifiable Observational Evidence for A Dynamic Non-Space Sun," which I drank up presently. The point is, I had a copy of that paper in the summer of 1990 -- four years before Mr. Leshan published his paper (IIRC) and I would gladly sign any sworn statement for any court of law to attest to that and to defend Mr. Goodfellow from any accusation of copyright violation or plagiarism. This seems to touch on something that has run through my head before; but not in the same terms. The thought being that perhaps a truly pure vacuum possibly exist beneath the outer 'shell' of planets/Suns etc. One that beckoned to be 'filled' but all efforts induced a variety of affects oriented about the 'surface' of that 'shell'. The similarity to that is what caught my attention and you're the first person that I've ever seen to actually concretize this! Very much like that. You can judge the veracity of this by reviewing the general concepts expressed in this March 12 post. My compliments though you're working quite nicely with it. Interestingly, and this is just a note, the idea came to me as a result of concepts regarding the Aether. There is a general hypothesis (for lack of a better word) in one or more of those theories that 'matter is the result of holes in the aether' i.e (space). That produced the thought, if true, 'My, that must be the purest of vacuums'. I've never forgotten it for some reason and so it sat in the Bag O' Options. Other than that - wasn't too thrilled with the Eddington appeal to conscience for Plasma Physicist. Could've done without that imho. Solar, you are quite right. It was a fatuous comment in the video, possibly ill inspired from my just having watched a film on the interaction between Eddington and Einstein, which obviously left too strong an impression on me. Let me say right off the bat, "I've never met Einstein - but I know I'm no Einstein"
hellsreach wrote: On my way out, he gave me a copy of his then paper, "Verifiable Observational Evidence for A Dynamic Non-Space Sun," which I drank up presently. Eric, believe it or not, I remember that day! So delighted to hear from you - and thanks so much, coming to my defense. You do me a great kindness. I am presuming most of the forum members are familiar with H. C. Oersted's famous experiment. Upon placing a compass on a table while inducing an electrical current through the copper wire, he discerned that the magnetic compass needle jumped when an electrical current was turned on and switched off. As you may have gathered from the thread, I am interested to see if electrical discharges create a gravitational induction, so for the sake of argument, I'm assuming that there was a proportional gravitational induction as well ( 1 x 10 to the 39th times weaker.) Could one find some way of discerning if this were true or false? Hello, gfellow, well, the the evidence at hand, demonstrating that electrical discharge contains the elements that allow for the induction of gravity (producing gravity without a corresponding quantity of mass,) simply lacks credibility. Last edited by nick c on Mon Mar 04, 2013 4:36 pm, edited 1 time in total. indie05 wrote: Hello, gfellow, well, the the evidence at hand, demonstrating that electrical discharge contains the elements that allow for the induction of gravity (producing gravity without a corresponding quantity of mass,) simply lacks credibility. Well, one DOES have to actually look for it. Sleds & Wheels - We have the electric - Where's the Gravity? I most throughly enjoyed going to the Albuquerque conference, and have just finished watching Bob Johnson's "The Electric Sun Revisited" http://youtu.be/JWpPetpI50U which I somehow missed. Bob Johnson concludes saying that we have to find a better means of maintaining the anode voltage. His lecture was again a reminder to me how much our scientific knowledge is hampered by our inadequacy of finding a linkage between the electromagnetic and the gravitational phenomenon; our civilization is akin to one which understands the sled, but has not discovered the wheel. As you can see from the source, the concept of non-space back then was treated as lunatic-fringe, and no one felt plagiarized. The concept that an electrical discharge induces gravity may be confirmed using a laser, an interferometer and a means to produce an electrical discharge. I have spent considerable time plowing through journals, looking for anyone who might have tried this, but no luck so far. I realize this is a simple description of an experiment and the devil is in the details, but the below diagram illustrates the principle. Yes, some have suggested to me that there is no such phenomenon, but if you're not looking for it, how do you know it's not there? I do understand the reluctance; in today's scientific community such an experiment could be tantamount to professional suicide, because the concept is almost alchemic. There no known parameters. For example, what is the strength of the induction? In a sense, it is as if one were going back in time to H.C. Oersted's accidental electromagnetic experiment in the 1820's. The localized gravitational force could have a momentary potential stronger than that of the Sun; it could be so weak that it does not register on contemporary instruments. Yes, a nul result is a distinct possibility; but imagine the implications of a positive result? Consider an ion vacuum chamber; the atmosphere is initially pumped out mechanically, then ions are fired through the partial vacuum to catch particles in order to create an even better partial vacuum. I propose that a lightning discharge does this on a much more efficient level, producing a dance of powerful repulsive magnetic forces that create a momentary absolute vacuum. Absolute vacuum - I call it Non-Space - is an absence of mass/energy/time. It is a volume surrounded by space and can only be described through the behavior of that medium. Non-Space induces gravity; space loves that, it crushes in on the Non-Space with annihilating force, an attraction indistinguishable from gravity, hence the imploding thunderclap. In this case it is a momentary phenomenon but I believe that on a larger scale, the phenomenon can be sustained, for example, our Sun.